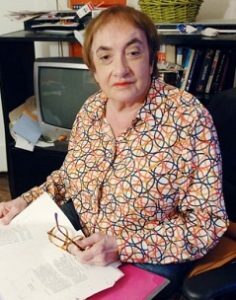 Lee Israel was an author, and primarily a biographer of high-achieving women. Some of her works were accounts of the lives of actress Tallulah Bankhead, journalist Dorothy Kilgallen, and cosmetics tycoon Estee Lauder. In the early ‘90s, Israel was working on a bio of Vaudeville singer and comedienne Fanny Brice. She was flat broke, her books were no longer selling, she was experiencing writer’s block, and her agent was unable to secure an advance for her Brice memoir. It was during this low period in Israel’s life and career that she reluctantly sold a local dealer a short personal letter she had received years earlier from Katherine Hepburn. Fetching more than expected, Israel then discovered a personal letter from Fanny Brice tucked away in one of the books she was researching for her upcoming biography. She proceeded to steal the letter out of the New York Public Library, and subsequently sell it to the same dealer – after adding her own personal salutation with an old typewriter whose typestyle was the same as that of the original Brice letter. Now she was onto something. Illegal, yes. But able to pay the bills now? Absolutely! And thus began Lee Israel’s “career” in forgery. When Israel passed away in 2014, she was known more for her forgery than for her biographies. Her own account of her criminal career, “Can You Ever Forgive Me?” has now been adapted to the big screen by director Marielle Heller, with an adapted screenplay by Nicole Holofcener and Jeff Whitty. 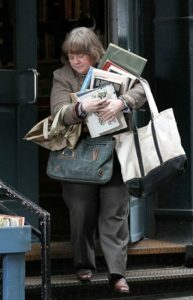 And who better to play Lee Israel than… Melissa McCarthy? She of the sharp-tongued wit whose motion picture career has yet to live up to its potential? Yes! McCarthy finally turns in a performance worthy of her talent in one of this year’s most surprising casting moves. McCarthy’s Israel is a loner – unfriendly without being downright rude to strangers, yet always with a little twinkle in her eye that lets us know she means well. 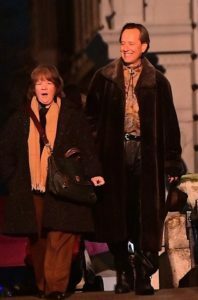 McCarthy’s Israel has just two good friends in her life – her cat, and her gay friend Jack Hock, played by Richard E. Grant in one of the year’s most engaging supporting performances. Jack is everything Lee is not – engaging, friendly, and bursting with personality. He is flamboyant, which was often considered off-putting in the early 1990s, but this is Manhattan, so its effect is muted. Jack is the only person who knows of Lee’s forgery lifestyle, and when the FBI catches on that her Noel Coward “letter” might be a fake, he takes the helm and sells her supposedly original and personal letters to various dealers around the city – almost as fast as she can produce them. The title “Can You Ever Forgive Me?” is obviously Israel’s plea to her fans and readers that she begs their forgiveness for dabbling in activity which could only be described as criminal. But it is also the closing line from a forged letter Dorothy Parker supposedly wrote to Israel – the letter that garnered her more than any of her other fakes. And the letter she attempts to buy back from a local bookstore at the end of the film. In the movie’s funniest (and most quaint) scene, Israel writes a sarcastic letter from Parker to the bookstore owner admitting its inauthenticity – even though Parker had died in 1967. “Can You Ever Forgive Me?” is perhaps finally the vehicle that will cement Melissa McCarthy’s place as a legitimate actress. Fortunately, the screenplay doesn’t call for McCarthy to make a great stretch; in other words, the screenplay seems to fit her talent – much as “Good Morning Viet Nam” allowed Robin Williams to display his natural talent within the confines of a well-scripted story. Here, McCarthy is more of a subdued version of her typical character – and consequently, she’s funnier here than she’s ever been. And Richard E. Grant turns in the finest performance of his career in a role that fleshes out that of Israel. Were Jack Hock not a part of Israel’s life (and therefore not a part of “Can You Ever Forgive Me?”), her story would come off as one wallowing in self-pity. The character of Jack allows that of Lee to blossom and shine. The two of them are great together, and (much as with the characters played by Robert Redford and Sissy Spacek in the recent “The Old Man and the Gun”) I could have watched the two of them talk in a corner diner for two hours and been equally entertained as I was watching the final product. “Can You Ever Forgive Me?” is a delight, and is likely to be one of the buried treasures of this Oscar season. I don’t foresee its being a major player in the Oscar race, but I do see it giving McCarthy’s career the heft it has deserved for a long time now.